Early voting has begun in Nevada's 2010 primary elections, and over the weekend many sources reported that Nevada election officials have added chicken suits to the list of items that are banned from polling places. 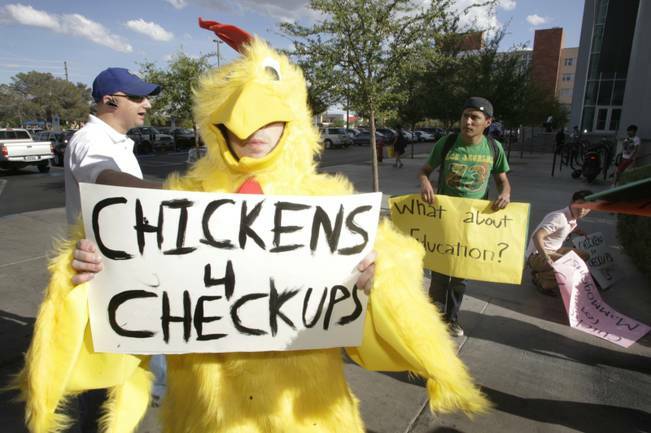 Man-sized chickens have been involved in Nevada politics this year because of a GOP Senate candidate's suggestion that people should try to control health-care costs by bartering with doctors for medical services, like when "our grandparents would bring a chicken to the doctor." Since then, Sue Lowden's campaign events have apparently been besieged by Democrats in chicken suits hoping to remind voters of Lowden's unique health-care strategy. According to the reports, election officials banned chicken costumes from the polls on Friday, May 20, but so far I haven't been able to find any official announcement of the change or a link to the revised rule on the Nevada Secretary of State's site or anywhere else. I have seen two county election officials quoted as saying that, in their view, a chicken costume would be an inappropriate anti-Lowden advocacy message, but haven't found a citation to any amended rule. (f) Soliciting signatures to any kind of petition. Nev. Rev. Stat. § 293.740. Chicken-suit wearing would seem to be covered by existing subsection (d), which prohibits the "wearing" of any "insigne" (the singular form of "insignia," I just learned) that tends to aid or promote the success or defeat of a candidate. That makes it seem unlikely to me that officials would have actually amended the applicable regulations (the legislature is not in session, so the statute hasn't changed) to address something that probably will be limited to this election, as opposed to just stating an opinion that wearing a chicken suit to the polls this year would indeed be a form of electioneering. If anyone knows otherwise, though, please let me know. Either way, please be on notice that chicken garb and, presumably, actual chickens or any representations thereof, are prohibited within 100 feet of any Nevada polling place on June 8.